There was a time when the mere timbre of a traditional non-European instrument was enough to pay sufficient tribute to a “world”-oriented musical work. Thanks to such composers as Lebo M. (“The Lion King”) and Bill Whelan (“Riverdance”), the techniques of traditional musics, not only their timbre, have been brought to the American stage. My specialty in this regard is the West African keyboard called gyil (pronounced JEEL). The gyil has a pentatonic keyboard consisting of 14 to 18 wooden bars that are played with two rubber-bound mallets. Its rich, buzzy timbre is produced by membranes spread over holes in the instrument’s gourd resonators. Traditional gyil music is soulful and healing, and complex enough to trick the uninitiated listener into believing, as I did on first listening, that more than one musician is playing. The gyil is from the region of West Africa where the borders of Ghana, Burkina Faso and Côte d’Ivoire meet. There the people believe that the instrument establishes a sacred connection to the spirit world. Its keys are fashioned from the wood of the Niira tree, which houses the Kontombe – spirit keepers of beauty, balance and good within the community. 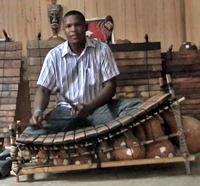 Dozens of mallet keyboard instruments, each with a different timbre, tuning system and performance technique are found throughout the African continent. The term “balafon” is a generic term akin to the word “xylophone,” meaning a wooden barphonic instrument. The gyil is known for being the “virtuoso solo balafon,” with a traditional repertoire that has inspired the awe of musicians throughout Africa and beyond. Its music has been described as a kaleidoscope of complex melodies in constant conversation, rapid-fire yet transparent. When writing for gyil, a composer should consider the instrument available. What key is it in? Traditionally there is no fixed pitch among gyili. Fortunately for us, the Pan African Orchestra, Ghana’s first large ensemble of indigenous instruments, introduced Western tuning to West African pitched instruments. The gyil’s most common keys in the U.S. are G major, C major and Bb minor pentatonic. Although there are gyil makers (like Ba-ere Yotere or Christopher Doozie) who will construct an instrument in whatever key is needed and ship it, it is more cost-effective to write for an instrument that is already available to you. The next consideration is who is going to play the instrument. Ideally, it will be someone who has studied it. However if such a person is not available, a competent marimbist can learn the basics of gyil. Please give that musician plenty of time to learn their part, as the topography of the instrument is more akin to a multi-percussion setup than it is to a chromatic marimba. The most efficient way to notate for the gyil is on two staffs, the lower for the left hand, upper for the right, somewhat like piano music, but with a shared beam among eighth and sixteenth notes in the different staves (see below). That way the musician can readily understand the rhythmic relationship between one hand and the other. An example of notation for the gyil. Notice how the stems of eighth notes from the “treble” (right hand) clef and the “bass” (left hand) clef share a beam. This is done so the performer can easily understand the rhythmic relation between one hand and the other. Excerpt from “Lo Ben Doma” by Kakraba Lobi. The gyil combines well with Western instruments. The composer must be careful to avoid obscuring the instrument’s lower register (lower bass clef F or G to the A a ninth or tenth above it) with other instruments in that register, unless he or she is actually doubling the gyil’s bass lines. High woodwinds and high strings do not hide the instrument’s sound in such a manner. 3. “Fer Barre Kona Jeno” (“Don’t Play Favorites”), a traditional song, orchestrated by Andrew Beall (Bachovich Music Publications). Please also refer to the transcription series “West African Music for the Marimba Solist” by Kakraba Lobi and others, and Ba-ere Yotere’s beginner method book “Kokolo” to observe traditional gyil compositional techniques. See www.mandaramusic.com for more, including links to sound examples from this essay. Valerie Naranjo, a Local 802 member since 1989, is the percussionist for NBC’s Saturday Night Live Band, and Broadway’s “The Lion King.” She is also a gyil solist and clinician, teaches African percussion at New York University, and has authored transcriptions, concerti and a method book for gyil. See www.mandaramusic.com.